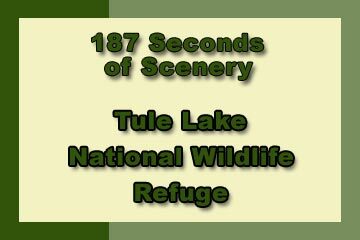 Tule Lake National Wildlife Refuge - Explore! 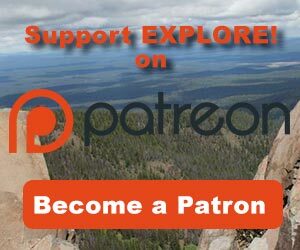 Tule Lake National Wildlife Refuge - Explore! Exploring the Refuge . . . These opportunities can fill a day if you take your time and study the wildlife. Bald Eagle display at the visitor center. The Visitor Center is located on Hill Road, five miles west of the community of Tulelake, California, USA (41˚56.785′ N 121˚ 33.906′ W). 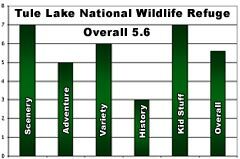 You will find some great wildlife exhibits and lots of information at the visitor Center. It is open from 8:00 am to 4:30 pm weekdays and 9:00 am to 4:00 pm on weekends and holidays. It is closed on Christmas and New Year’s Day. 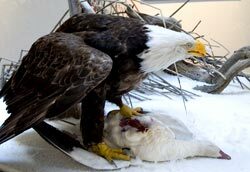 The bald eagle, in the photo, is part of one of the displays. A unique outdoor display brings together all the habitat elements that attract the small, but often colorful, birds of the area. While the display is outdoors, your best vantage point is through the large windows. 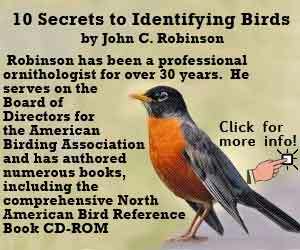 Refuge biologists will even help you identify the birds you are seeing. While at the visitor center, you can watch the refuge video called “Stepping Stones.” You can also watch that video right now as it is attached to our overview article on the refuges. If you would like to do a little shopping, there is a small store that offers books, apparel and other items that might interest you. Be sure to pick up the colorful, and free, brochure entitled “Klamath Basin National Wildlife Refuges.” It includes a map of the refuge that you will find helpful. At the rear of the Visitor Center’s parking area, you’ll find a trail leading up the ridge to a stone lookout that was constructed by the Civilian Conservation Corps in 1938. The trail itself was constructed in 1936, also by the Civilian Conservation Corps, and used by the workers to move materials for the lookout up the hill, in wheelbarrows. Pick up the trail guide at the start of the trail. It is keyed to stops along the trail and addresses cliff swallows (the same ones that return to California’s San Juan Capistrano Mission each year), yellow-bellied marmot, raptors, gopher snakes, western fence lizards, mule deer, wrens, and the lookout. The animals you see will depend upon the time of year and time of day you take the hike. You’ll almost always see raptors of one sort or another and, at least, evidence of mule deer. Tracks indicated more deer use the trail than humans, but I didn’t see any there. The photo shows how the lookout is perched high on the cliff face. Fortunately the trail avoids most of the cliff by winding up a less steep area to the right of the photo. The trail is only about 1/3 mile long (round trip), but it gains about 200 feet of elevation. Besides learning a few things, I found that stopping at the points of interest along the trail also provided me with an opportunity to catch my breath. The last 30 yards, or so, of the trail to the lookout follows a narrow ledge above the cliff face. There is a rickety-looking post and chain barrier that seemed pretty useless to me. If you have your kids along, be sure they behave properly along this section. At best, a fall would be pretty painful. The view from the lookout is spectacular. You can see the entire refuge and far beyond. The photo of Discovery Marsh, below, was shot there. For greater adventure, there is an unmarked trail leading up the ridge that leaves the wildlife trail just before the narrow ledge that ends at the lookout. This trail winds through grassy areas to the top of the ridge. From there, you can see all of both the Tule Lake Refuge and the Lower Klamath Lake Refuges and nearly 100 miles beyond – all the way to Mt. Shasta to the south and Crater Lake to the north. Discovery Marsh is located across Hill Road from the Visitor Center and has its own parking lot. It is a wetland constructed by the refuge to offer three types of habitat (seasonal marsh, shallow wetland and permanent marsh). In combination, these habitats attract a wide array of species. It was relatively quiet the day I visited, but I saw at least 27 mule deer, 5 pheasants, a pair of greater yellowlegs, a grebe, a raptor, several types of ducks and geese, red-winged blackbirds and a variety of small birds (like sparrows and house finches). A few of the other birds you might see in the marsh and the surrounding grasslands and trees include: killdeer, white-faced ibis, white-fronted goose, mallard duck, red-tailed hawk, great blue heron, American white pelican, snow goose, marsh wren, yellow-headed black bird, northern oriole, yellow-rumped warbler, great horned owl, great egret, American avocet, ruddy duck, horned lark, long-billed curlew, savannah sparrow, cinnamon teal, Ross’ goose, and cackling Canada goose. Typically one would see a coyote or two in the fields to the south of Discovery Marsh, but I didn’t see any on the day of my visit. The trail leaves the parking lot and circles the marsh in the middle of the above photo. A longer loop continues all the way to Tule Lake, in the background of the photo, and back on the other side of the drier wetland. There are several interpretive signs along the shorter loop to help you appreciate what this habitat has to offer. There are also a couple of kiosks with more interpretaion about the birds, habitats and refuge management. 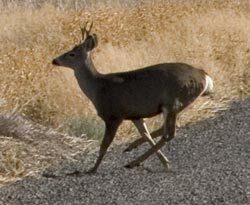 A Mule Deer Scoots Across the Tour Route South of Sump 1B. The Wildlife Tour Route is a self-guided auto tour along the western and southern parts of the refuge. The first stop is at a boat ramp along Hill Road just south of the Visitor Center. A great variety of birds can normally be seen there, but on the day of my visit there were several boats with hunters coming and going, thus keeping the birds away. The second stop is on the west side of Hill Road a bit above water level to offer a better viewing angle, but a longer distance view – binoculars are always helpful when looking at birds. There is a large parking lot and some interpretive panels. One addresses habitats, one addresses geology and the third addresses the Native American history of the area. The tour route turns east as it leaves Hill Road. There is a sign on the bank on the west side of Hill Road, but it may be obscured by vegetation (the turn is here: 41˚ 52.713’N 121˚ 33.462’W). You will find a box, once on the gravel road, where you can pick up the tour brochure with more information about each stop. The refuge includes both water and cropland and is divided into ‘sumps.’ This segment of the tour follows the south edge of Sump 1A to the ‘English Channel’ that connects Sump 1A to Sump 1B, along the west side of the English Channel then along the west and south sides of Sump 1B. There are several stops along the way that highlight the wildlife you can expect to see and various aspects of refuge management. Stop 11 offers a parking area and a short walk to a viewing kiosk, with a telescope for a better view. It overlooks habitat designed for Caspian terns, pelicans, gulls, herons and egrets as well as osprey. We scared up a good sized group of geese of mixed species. They are featured in the video below. The tour route connects to and ends at County Road 120 within the Lava Beds National Monument. If you take that road to the west, toward the Lava Beds entrance station, you will see two wildlife overlooks on the north side of the road. They both offer parking and a nice overview of the refuge. We spotted another pheasant along the road to the first overlook. If you are a serious photographer, you will want to check out the various blinds that the refuge offers. There are a couple designed to get you close to water birds and a couple designed to get you close to eagles and other raptors. These are available for use by reservation only. A refuge season pass is required for anyone using photo blinds on the Refuge. You may only reserve one blind per day, but may reserve a given blind for up to two days per week. Blind reservations are on a first-come, first-served basis and accepted only within six months of the first date the blind will be used. Early morning light will get you the best photos from these blinds. The Fish and Wildlife Service offers more information on the birds you can expect to see at each blind depending upon the season of your visit. I visited too late in the year to be allowed access to the canoe trail. If you visit from July through September, you can use a canoe provided by the Fish and Wildlife Service for free. Just ask at the Visitor Center. The canoe trail is located among the trees at the far end of Discovery Marsh and the canoe can be found along the trail between the end of Discovery Marsh and Sump 1A (at the top of the large Discovery Marsh photo above). Pick up the canoe, place it in the water and away you go. It takes about 20 minutes, I’m told, to paddle the whole figure-eight trail. Sounds like great fun for kids. I rated the scenery fairly highly for the broad western landscapes, the upland ridge and cliffs and the water. The adventure is a bit limited, but a climb to the top of Sheepy Ridge and along the ridge offers more. There is a good variety of things to do here, from the auto trail to the canoe trail. There is one interpretive panel about American Indian use of the area and some information about the construction of the lookout by the Civilian Conservation Corps. Kids should enjoy the visit for the high likelihood of seeing wildlife, for the interesting walks and for the canoe trail. Overall, I gave this place a rating of 5.6. 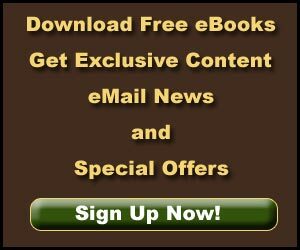 If you have been here and would like to offer your insight, please use the comment form below. All text, photos and the video were created by Jerry Haugen, Pathfinder, and are ©2010 Global Creations LLC, All Rights Reserved.